Alchemical emblems do not only appear in manuscripts and book illustrations. Here is an elaborate emblem found on an alchemical coin. These coins appeared in the 17th century and purported to have been cast from gold or silver made alchemically, often as a way of commemorating the supposed transmutation. This particular coin has survived and can be seen in the Kunsthistorisches Museum in Vienna as item 145543. 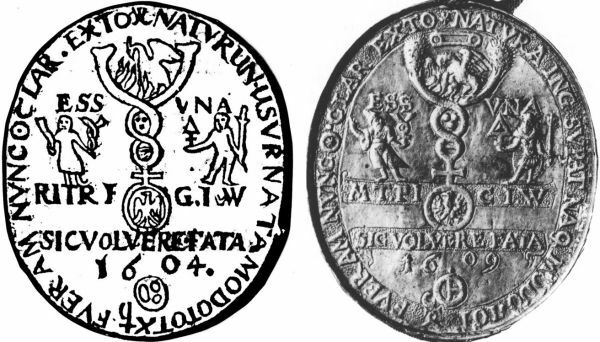 The drawing on the left was apparently made from the actual coin, but the person who drew it misread the date as 1604 not 1609. We have a caduceus emerging out of the symbol for Venus. Within the circular part of the Venus symbol we see an eagle with its wings extended. In the upper section of the caduceus we see a pelican feeding its young, and the upper arms of the caduceus seem to reach out to a Sun and a Moon symbol, though this is not entirely clear. Between these arms and above the pelican is the alchemical symbol for Auripigment or Orpiment, the deep yellow sulphide of Antimony. This perhaps is to be seen as being opposite to the symbol of Vitriol placed at the very bottom of the coin. Vitriol, of course, is the name for strongly corrosive sulphuric acid, or for metal sulphates, such as that of iron, zinc or copper. It was a key substance used in alchemy. To the left and right of the central caduceus are two figures. The one on the left holds the symbol for mercury in one hand and what could be a cornucopia in the other. The figure on the right holds the symbol for Sulphur in one hand and a sceptre in the other. In the intertwined parts of the caduceus we see two other symbols. The lower circular form has a horizontal bar across it. This is the symbol for Salt. Thus we have the Three Principles of alchemy - Salt, Sulphur and Mercury. The upper circular space appears to have three dots within it. This may be the symbol for oil. The text above these two figures can be read "Essentia Una", one essence. The text above the date reads "Sic volvere fata" - Thus the fates have decided. The letters in the phylactery above are "MT. PI C I. W." It has been suggested from historical sources that "CIW" should be read "Comes in Waldeck" and refers to the Counts of Waldeck, a sovereign principality which included the town of Kassel in Germany. The text around the circumference can be translated as "Originally one in my nature, now I am entirely regenerated. I was lead, behold me now most brilliant gold". There is a great deal of symbolism compressed into this little coin.